Do you ever want to make a meal special without too much work? I like to do that by adding a quick and easy dessert to a typical week night dinner every few weeks or so. It’s just a way to give my family a surprise they weren’t expecting. 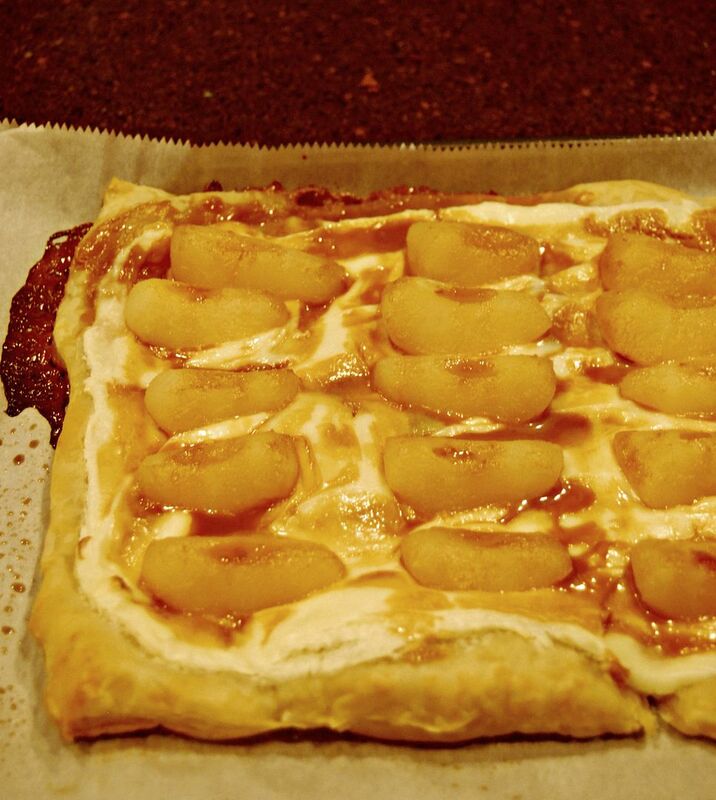 I’ve found using puff pastry is a fast way to make an amazing dessert without much hassle. You can top it with just about anything. I like to use cream cheese with fresh, frozen, or even roasted fruit. Then, it bakes while dinner is served, so you have a delicious warm dessert at the perfect time. 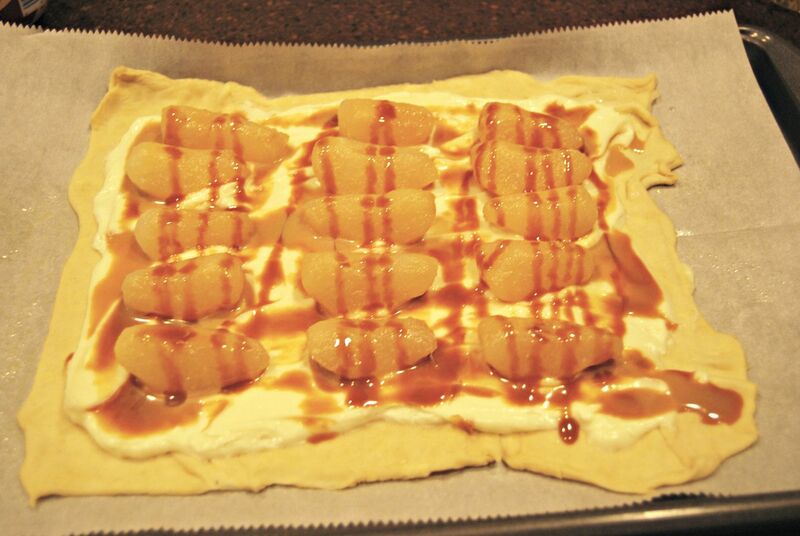 I roasted some pears that were about to go bad, and then topped this dessert with them. Roasting fruit is very easy and delicious. 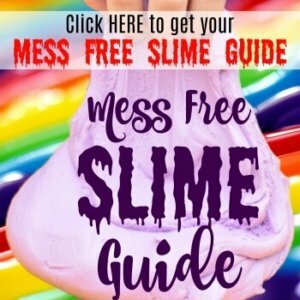 You can do all kinds of things with it. I once saw this grilled cheese filled with nutella, brie, and roasted strawberries. One of these days I’m going to recreate that sandwich. There is an easy South American dessert with dulce de leche sauce over roasted fruits like apricots or peaches that tastes heavenly. I was out of both of those fruits, so I thought the next best thing would be pears. I was very pleased. It turned out heavenly. For the Dulce de Leche sauce, there are a couple of options. In the Mexican food department at the grocery store, Nestle’s has both a syrup and canned dulce de leche. For this type of dessert, I like to use the syrup because it’s easier to drizzle. With the canned dulce de leche, it needs to be heated up to thin it into a sauce before adding it to the dessert. Also, another option is whether to add the sauce before or after baking. I like to add it before. 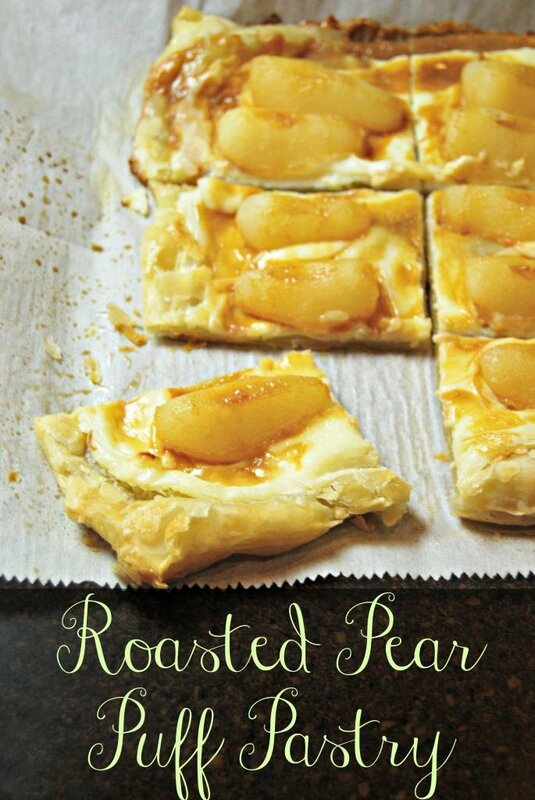 By drizzling it over the pears, It infuses into them while baking and tastes just delicious. The flavor from the combination of the cream cheese and dulce de leche reminds me of Mexican milk candy and tastes so good. Slice pears and toss with 1 tbs sugar. Spread evenly on a cookie sheet and roast for 15-20 minutes. Allow cream cheese to soften to room temperature. Then, microwave for 20 seconds. Mix cream cheese with 1/4 cup sugar. Lay out the puff pastry sheet on parchment paper. Spread the cream cheese along the pastry sheet, leaving some crust at the edges. 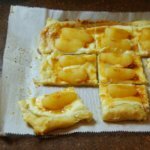 Lay out the pear slices on the puff pastry. 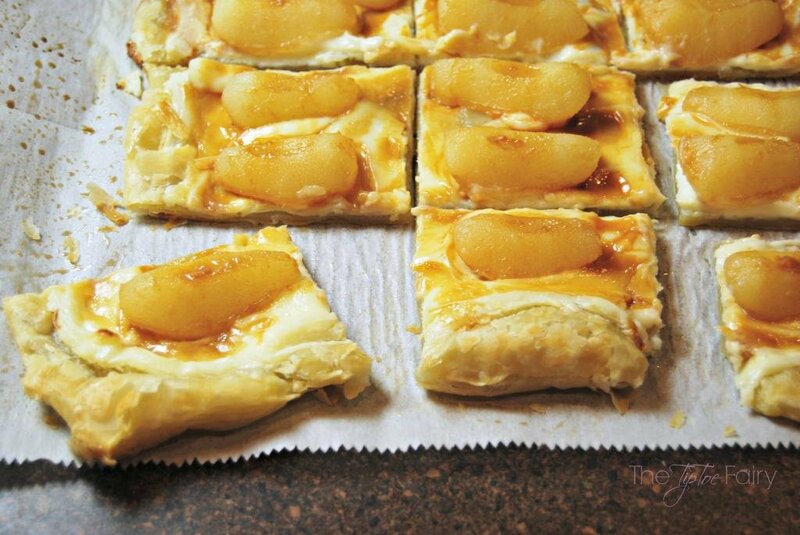 Squirt syrup all over the pears and puff pastry. Beat egg with 1 tbs water. Then, brush egg wash all over the edges of the puff pastry. Allow to cool and then cut into squares. This looks delicious, simple and very elegant! I love making surprise desserts too! What a lovely dessert, love it! If only I could find good gluten-free puff pastry!! 🙂 This looks amazing, m’dear. Sounds amazing! Puff pastry is such a gem for quick-prep dishes. I adore roasted pears and can imagine how great they are with dulche de leche!